LOVE. Today I want to talk to you about one of my favorite websites ever, Bloglovin.com. I was one of the first members when the site was launched almost 5 years ago and I remember being beyond excited when I reached my first 100 followers. Today I hit 100,000 followers (!) and I seriously can’t believe it! HUGE thank you to all of you who are following me on Bloglovin’, it means the world to me, and if you’re not using it yet, get on it! It’s a great way of keeping track of new posts from your favorite blogs in one place, and for me who follow around 100 blogs, it’s a real life saver! This entry was posted in Fashion and tagged 100 000 followers, Bloglovin, fashionsquad by Carolina Engman. Bookmark the permalink. cONGRATS! you deserve it, your blog is amazing! congrats Carolina, i’m happy for you!!!! 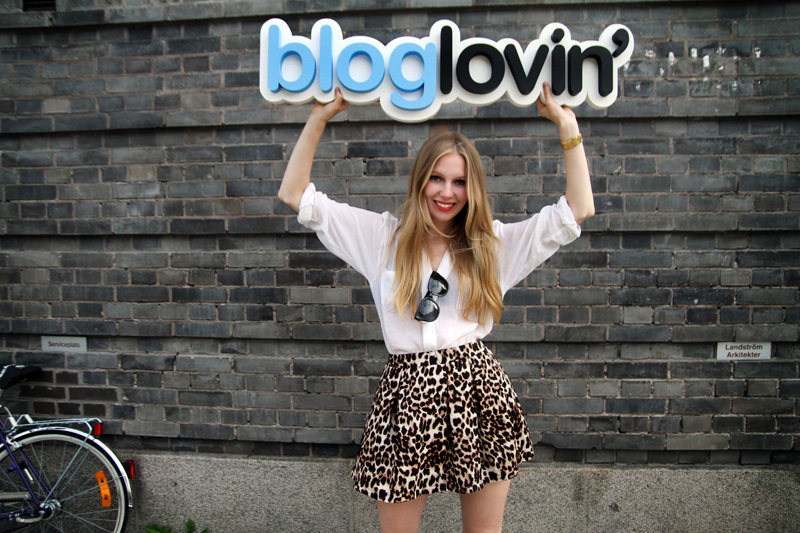 I’m also a user of bloglovin’! It’s actually how I found your blog in the first place! And you’re right, it’s great for keeping track of all the blogs I follow! Congratulations! You have such an inspiring website! Wow, that’s so much and so amazing! Congratulations!!!!! congrats! i am one of the 100.000 hahaha. you’re amazing! love your blog! congrats again! CONGRATULATION!! 100000 Followers is quite a milestone! Congrats! I’m following on bloglovin. Love it. Congrats! I just recently started following you on Bloglovin and I always look forward to your posts. Keep up the awesome work and thanks for the stylie inspiration! Congratulations. Bloglovin is the only tool I use to follow other blogs. It’s so compact and easy to use. I’ve been following you on bloglovin and I haven’t missed a single post. Congrulations! You totally deserve it! First of all you look amazing, and CONGRATULATIONS!! congrats girl! this must me so exciting. and let me tell you, you really deserve it. love your blog and follow it for a pretty long time now and still like every post a lot! Same for me. Since I found out Bloglonvi’n existed, it was such a great day, not because of my followers but because it the perfect way to keep on track of my favorites blogs. Including yours! By the way, lovely animal print skirt! It would be a great skirt to combine it with my new studded maxi bag. CONGRATS CONGRATS – that’s huge!! Such an incredible amount of bloglovers! Omg you totally deserve it! Congrats!! Love your skirt by the way! super super cute! That is SOOOOO awesome! Congrats to you! congrats. I hope that I can be as successful as you someday!!! congrats! bloglovin’ is one of my favorite sites also… love the skirt, by the way! congrats babe! you are awesome! Congrats, your blog is amazing! As I said in my post, someone always compliments me on it when I wear it. I guess people enjoy wimsy and fun patterns. Isn’t your boyfriend one of the founders of bloglovin ? Congrats on the followers. Cool photo ! Usssummm, now I want that Bloglovin’ sign – you guys didn’t even give me a sticker, zomg so sad. Congrats dear,you really deserve it! Congratulations on reaching 100k followers! congratulations! that is an amazing accomplishment! Congratulations such an achievement! Love the skirt by he way! Congrats!!!! Hope to be in your shoes one day!!! CONGRATULATIONS, so exciting and very very well deserved! CONGRATULATIONS! how very exciting and very well deserved! I notice that you are a big fan of animal print! !Me too!!!! Congrats to you. I love your blog and follow you on Bloglovin. Congratulations -you definitely deserve it! you totally deserve this. CONGRATS CAROLINA!!! WOOHOOO!!! I HOPE ONE DAY I’LL BE AS SUCCESSFUL AND POPULAR A BLOGGER AS YOU! By the way, I’m doing a giveaway in my next post, would you like to follow each other so you’d won’t miss it? Congrats! U r just awesome! Congratulations! I’ve only just signed up and can’t imagine reaching 100 followers, let alone your count :) you should be very proud! Discover my Stylish Confessions! ? I love Bloglovin it’s great to have all your fave bloggers new posts listed in one place ready to scan through when you get a spare few mins! CONGRATULATIONS!!! That is so awesome! I joined bloglovin yesterday, I’ve always known about it and I don;t know why its taken me so long to join. I love it! I will be following you now! Wow congratulations ! ps. great leo skirt. Congratulations! That’s amazing! How can I increase the number of my followers on Bloglovin? I have a really nice site for moms, all about fashion, fitness, and lifestyle. I have pretty good traffic, but can’t seem to make any headway on Bloglovin! Aww, this photo is so cute! Congrats!! that’s SO AWESOME! congrats, gorgeous! you deserve it! Congratulations! I’m still awaiting my first 100! So please follow me people! Congrats deary! I’ve quite enjoyed your blog since I began following you :) Much love!! Congrats ! Well done ! Congratulations! I hope to get there someday! Congratulations! I actually recently discovered your blog through Bloglovin and am so glad I did. I love your posts and am discovering so many great brands, look inspiration, etc. from you! Keep up the great work!